Jardines 7J Ranch Garden Original Salsa has an incredible "fresh from the garden" flavor that rivals anything you can make at home without all the work. No prepping, no chopping, no vinegar, no water...just delicious! 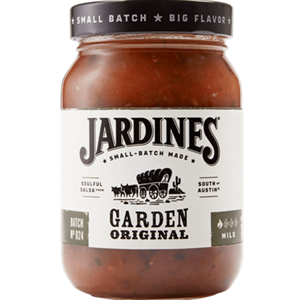 With a squeeze of fresh lime juice, Jardine's 7J Ranch Garden Original Salsa tantalizes with the roasted sweetness of garlic and fresh roasted jalapenos. Savory goodness with the freshest of flavor. The best of both worlds Serve it up chilled for an extra fresh experience. 16oz. Tomatoes, tomato juice, water, onions, bell peppers, cilantro, tomato paste, dehydrated onion, jalapeno pepper, distilled vinegar, salt, potato starch, dehydrated garlic, spices, citric acid, calcium chloride.